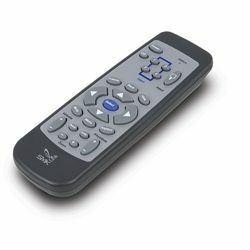 Compatible with all the leading brands of LCD and DLP projectors, the Universal Projector Remote Control is pre-programmed to control nearly every model on the market. It even has a learning mode in case you find a projector that it isn't designed for. Compatible with projectors from 3M, BenQ, Boxlight, Canon, Casio, Christie, Dell, Dukane, Eiki, Epson, Hitachi, HP, InFocus, JVC, Mitsubishi, NEC, Optoma, Panasonic, Phillips, Pioneer, Polaroid, Polyvision, Samsung, Sanyo, Sharp, Smart, Sony, Toshiba, Vidikron, Viewsonic and others. Includes 2 AAA batteries.